Jeff Sessions: Completely Out Of Touch With Honesty Or Truth? WASHINGTON — As a senator, Jeff Sessions was such a conservative outlier on criminal justice issues that he pushed other Republicans to the forefront of his campaign to block a sentencing overhaul, figuring they would be taken more seriously. Now Mr. Sessions is attorney general and need not take a back seat to anyone when it comes to imposing his ultratough-on-crime views. The effect of his transition from being just one of 535 in Congress to being top dog at the Justice Department was underscored on Friday when he ordered federal prosecutors to make sure they threw the book at criminal defendants and pursued the toughest penalties possible. “This is a key part of President Trump’s promise to keep America safe,” Mr. Sessions said on Friday as he received an award from the New York City police union to mark the beginning of National Police Week. Given Mr. Sessions’s long record as a zealous prosecutor and his well-known views on the dangers of drug use, his push to undo Obama-era sentencing policies and ramp up the war on drugs was hardly a surprise. But it was still striking, because it ran so contrary to the growing bipartisan consensus coursing through Washington and many state capitals in recent years — a view that America was guilty of excessive incarceration and that large prison populations were too costly in tax dollars and the toll on families and communities. In an increasingly rare achievement, conservatives and liberals had come together on the issue, putting them on the verge of winning reductions in mandatory minimum sentences and creating new programs to help offenders adjust to life after prison. Given the success shown by similar changes at the state level, bipartisan majorities in the House and the Senate seemed eager to move ahead on the issue last year. Despite the strong support, stiff opposition from Mr. Sessions and a few other outspoken Republicans — Senators Tom Cotton of Arkansas and David Perdue of Georgia among them — stalled the bill in the Senate and sapped momentum from a simultaneous House effort. As the 2016 elections approached, Senator Mitch McConnell, the Kentucky Republican and majority leader, shied from bringing to the Senate floor the politically charged issue that had divided his party. So the effort died, much to the disappointment of the unusual cross-section of advocates behind it. Backers of the sentencing overhaul say that Mr. 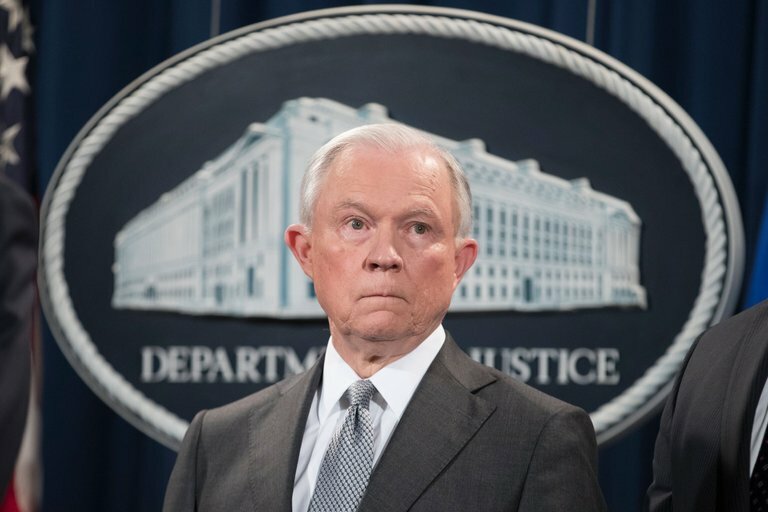 Sessions, who as a senator from Alabama supported legislation that would have made a second marijuana trafficking conviction a capital crime, is living in the past and is badly misguided. “Locking up people who don’t pose a threat to public safety is a waste of taxpayer money, a waste of resources and doesn’t deter crime,” said Steve Hawkins, the president of the Coalition for Public Safety, a sentencing reform advocacy group whose partners are as diverse as the liberal Center for American Progress and the conservative FreedomWorks. These organizations, along with Koch Industries, argued for sentencing changes as a way to save governments the huge costs of maintaining prisons and to make more productive contributors out of nonviolent offenders — a rare win-win for ideologically divided factions. The wide backing, which came as an opioid crisis was hitting economically struggling communities across America, struck a chord with Republicans who might usually balk at a less punitive model. Prominent Republican backers in the Senate included John Cornyn of Texas, the No. 2 party leader; Charles E. Grassley of Iowa, the Judiciary Committee chairman, who was instrumental in advancing the legislation; and Mike Lee of Utah, a well-respected younger conservative. But while these lawmakers saw an opportunity to take a new approach to sentencing and incarceration, Mr. Sessions was not convinced. Despite a broad decrease in crime in recent years, Mr. Sessions believed that a recent surge in violence in some cities showed that America was again at risk. An early backer of Mr. Trump, Mr. Sessions shared his stark vision of an urban America besieged by criminals, and argued that plea deals disguised the real nature of crimes committed by people portrayed as nonviolent. Mr. Sessions repeatedly said that going soft on crime would accelerate a return to the days of drug-fueled criminality across the country — a point he reaffirmed on Friday. In the Senate, Mr. Sessions was more than willing to cede the limelight on the issue to Mr. Cotton, a rising star among conservatives who referred to the Senate legislation as the “criminal leniency bill” and said America was suffering from an “under-incarceration” problem. But Mr. Sessions remained a crucial force. “He’s been the No. 1 opponent of the bipartisan effort in the Senate to reduce mandatory minimums for low-level nonviolent drug offenses,” said Senator Richard J. Durbin, an Illinois Democrat, who was one of the chief authors of the bipartisan bill. Advocates of the sentencing changes say they hope that the unilateral move by Mr. Sessions will stir Congress to intervene and establish new policy through legislation. And Jared Kushner, the president’s adviser and son-in-law, has been assigned the job of working on a criminal justice overhaul, among other issues. But pushing the bipartisan approach would require confronting the sitting attorney general and perhaps the president — a challenge many Republicans may not be willing to accept. None of the chief Republican backers of the Senate legislation issued any public reaction to the new Justice Department directive on Friday — not a good sign for proponents of an overhaul. As a senator, Mr. Sessions succeeded in stalling the sentencing reform movement. As attorney general, he has sent it reeling in Washington, and it could be very hard for advocates to regain their footing while he is the nation’s chief law enforcement official. CJ , says they aren’t worried about the the fellow smoking pot air his home! If that’s true it’s time Federal Law is changed takeing pot off of schedule One and move to 3 or 2 and a system for people to buy it Legally and State and Federal TAX can be collected, and a new industry made legal in all 50 Stares.